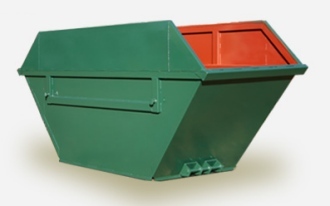 A skip is a portable waste container, made of metal and very strong. It will normally be delivered to your address and collected, with its contents, after an agreed period of time. A skip might be installed on your domestic driveway or green space or at the side of a public road. For keeping a skip on the road, a council permit and extra cost is likely to be involved. If your skip needs to be kept on the road, try to find out the local arrangements in good time. Skips are available in a variety of sizes and shapes. For domestic use, you will have three main size choices: A mini-skip, a midi-skip and a builder's skip. The last will also come as small or large and you are then entering the territory of skips that are large enough for commercial waste removal. See, Below, the example of a '20 Yard Roll On Roll Off' container. The capacity of a skip clearly depends on its physical dimensions - the length, width and height and its particular shape. There should not be any mystery associated with these physical quantities. However, investigation of skip descriptions published by various companies on the internet suggests that a 'Two Yard' skip (2 Cubic Yards) from one trader will not hold the same amount of contents as a 'Two Yard' skip from another! We found the same with 'Four Yard' skips. So, you might decide to take any claims about the capacity of skips with a pinch of salt. It is safer to visit the supplier and see what sizes they have. Here is one example: The dimensions of a '2 Yard mini-skip' were given as height 2 feet 6 inches, length 4 feet and width 3 feet. A rectangular box with that shape has a volume of 30 cubic feet. 27 cubic feet is one cubic yard. Small skips normally have sloped ends, so I doubt that the skip holds even one cubic yard, certainly not two. Some skips have a hinged panel at one end. If it is lowered, then access to the inside of the skip will be easier. For example, using wheelbarrows and a ramp for loading. The price you will be asked to pay will depend on many factors. Not least is the length of time that you propose to keep the skip but also the nature of the contents is likely to have a bearing. You might be quoted a price for filling with soil, grass, stones and other products of a building excavation but you might be quoted a different price for a more varied mixture including junk, wood, plastic, metal, clothing and broken glass. Some items might be refused, such as food waste, computer screens and televisions, full paint cans, oil, batteries, aerosols, gas canisters, tyres, fridges or freezers, asbestos or plasterboard. You need to discuss the type of contents which you have in mind before asking a trader to deliver a skip. Finally, you should understand the trader's terms and conditions, including their policy about filling a skip. Will anything be tolerated that stands up higher than the top of the skip? The skip shown above has a capacity of 9 Cubic Metres or 12 Cubic Yards. It is based on a skip with a flat top having a capacity of 6 Cubic Metres and 8 Cubic Yards. The side walls have been extended. Dimensions are approximately height 6 feet, length 12 feet and width 6 feet. The next skip is a mini skip, with a capacity of 2 Cubic Yards by our calculation. It might be advertised at 2.5 Cubic Yards or even more! Dimensions are approximately height 3 feet, length 6 feet and width 4 feet. Midi skips are larger than mini and a typical capacity advertised will be 3 Cubic Metres, equivalent to 4 Cubic Yards. The top might be flat or the sides might be raised, similar to the one at the top of the page. Then builder's skips are typically 6, 8 or 10 Cubic Yards and quite long, say 8 to 12 feet. The last example is a large waste container, known as a Roll On Roll Off. Capacity would be around 20 Cubic Yards. The length would be around 20 feet. Capacities up to 40 Cubic Yards are common for this type of container.